Census Of Hallucinations - "Sixth Sense"
Since at least the time of Mesmer, the mysterious "sixth sense" has been associated with paranormal phenomena, including the ability to perceive supernatural apparitions. 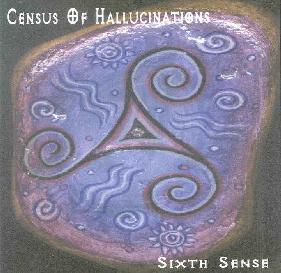 The Sixth Sense is also the latest release from England's Census of Hallucinations; unbelievably, it's their sixth full-length CD in 2 years! But if fans were expecting more of the loopy weirdness, wacky political humor, and great song writing from the last five CoH releases, they will be in for a bit of a shock, as I was. The Sixth Sense is a definite departure; a far more low-key, jazzy, ambient, and mostly instrumental album. While Gong and Steve Hillage influences abound, Tim Jones and his co-horts don't just rehash what has come before. We've come to expect more from them, and we get it. Nozy Parker sounds like Gong running headlong into a west coast bland out, Tom Scott's L.A. Express on acid, if you will. Tim Jones gives us some superb jazzy stylings on the electric guitar. Floating Away could have easily nicked a title from The Orb's debut album. With it's dreamy synths and space vocals, coupled with softly picked guitar, Spanish Castles in Space would have seemed a more appropriate title for this song than the piece The Orb used it for. Much of the rest of album is similar to the ambient breaks on previous CoH albums, such as the sound effects laden trance of Organic and the gentle, lullaby melody of Circus, though the band does pick up the pace a little bit for the almost danceable electronica of Where?. A couple of tracks that break the mould here are the only two "songs" on the album, both purely acoustic cover tunes. CoH turn The Beatles' Yellow Submarine into a sort of little skiffle song, and they take a nice, raw bluesy turn on Status Quo's In My Chair. Considering the style of the rest of the album, these two cuts do seem a bit out of place, but I like them both, so what the hey. The final track, Opening the Trapdoor to Outerspace, is the most minimalist thing that CofH have done. It's almost an ambient dub piece, with very subtle shadings of deep space electronics. Unfortunately, it doesn't vary that much, and I found its 9 minute length a little unjustified. The Reverend Rabbit provides little interludes of narration here and there, throughout the album, musing over esoteric science, sacred geometry, and ancient wisdom, though often he merely just lists off things, like "Cydonia" and "ancient Egypt", leaving the listener to draw his or her own conclusions as to the connections. There's nothing as wilfully weird on The Sixth Sense as there was on previous CoH albums, but it does seem like a more focused effort, less cluttered than earlier works. At any rate, the band continues to explore new territory. It will be interesting to hear where their explorations take them next time. For more information you can email Stone Premonitions at: info@archhouse9.fsnet.co.uk. Post Script: For those interested, I did a little research to find out where the band got it's name: The Census of Hallucinations was an early survey conducted by Edmund Gurney, F. W. H. Myers, and Frank Podmore in 1886 for the publication "Phantasms of the Living". The study was expanded in 1889 by the Society for Psychical Research in London. The final report, published in 1889 included data taken from a public sample of 17000 people. 1684 of those people responded that they had seen some kind of supernatural apparition at least once in their lives.